A rugged PC in a waterproof stainless steel case sealed to IP65 for food manufacturing and processing companies. Made from stainless steel and sealed to IP65. the PC Guard PCT-65 Rugged PC is assured to continue to operate properly in hostile environments. ensuring that your production continues to function at full capacity 24 hours a day. With PC-Guards rugged PC's, you can be confident that they are purpose built for life in hostile wet environments. PCT-65 Rugged PCs, a robust design configured to work in hostile environments. 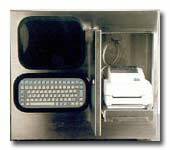 IP65 Pentium PC with 12.1 TFT screen and stainless steel enclosure. External interface by IP65 connectors with screw on protective caps for power, keyboard, RS232 for com port 1 and Ethernet (CAT5/RJ45 to IP68 connector). Scanner continues to operate properly in hostile environments. Protecting your investment and ensuring that your production continues to function at full capacity 24 hours a day. Reads all bar-code formats Wall or table mount units available. Database of rugged computers and computer cards used in industrial environments. Provides catalogs and technical information. Online retailer of industrial computer components, including backplanes, power supplies and more. Supplies ruggedized and industrial rack mount computers and related products, including monitors, touch screens, and thin client terminals.